Madras White Buffalos football shut out rival Corbett Cardinals in 24-0 victory. 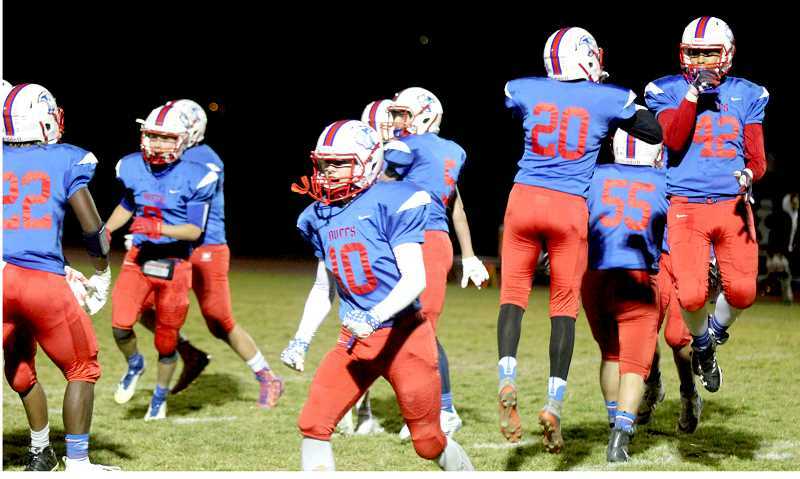 The Madras White Buffalo football team moved to 5-3 overall, 3-1 in league after defeating football rival, Corbett. The Buffs beat the Cardinals 24-0, after a slow first half. Madras scored in the first quarter on a 7-yard run by senior Victor Torres. Torres missed last week's game against Scio with an injury. The made extra-point by Kaegan Prevett gave the Buffs a 7-0 lead. Madras and Corbett were both held scoreless in the second quarter. "They came out with a completely different defensive game plan and kind of knocked us in the mouth in the first half," head coach Kurt Taylor said. "We made some adjustments in the second half and kind of took it away. They did something we were not expecting defensively, and it took us a while to figure out what they were doing. Once we figured it out, we were able to run the ball the rest of the night." In the third quarter, Torres ran for a 55-yard touchdown and Prevett's made PAT gave Madras a 14-0 lead. Prevett also hit a 32-yard field goal and gave the White Buffalos a 17-0 lead at the end of the third quarter. "Kaegan is clutch," Taylor said. "Every time it seems like we stall offensively, it is such a relief to know that we can still put points on the board when the offense is not scoring every single series." In the fourth quarter, Corbett had the ball on offense, but Liam White intercepted an option play and ran it in the end zone. The touchdown was taken away due to a holding call after the interception. The good field position set up a Kody Zemke 3-yard touchdown run and the made PAT gave Madras a 24-0 lead. The Buffs maintained their lead the rest of the game and beat the Cardinals 24-0. "It was a good win for us, a good away win, especially against a team that has kind of had our number in the last couple of years," Taylor said. "We have a good rivalry that has been brewing with Corbett. They played us really tough. It seems like everyone wants to play up to us." Torres led the team on offense with 117 yards and two touchdowns on 17 carries. Quarterback Robert Pacheco ended the game with 59 passing yards and 41 rushing yards in the game. The Buffs had 226 total yards of offense against Corbett. Defensively, Madras held Corbett to only 123 total yards of offense. The Cardinals were 4-16 on third-down and 1-4 of fourth-down attempts. "Our defense was absolutely lights out," said Taylor. "I mean really unbelievable. It was a great game to set the tempo for this week." "That kid (Zemke) played the toughest football game I have seen in a long time," Taylor said. "He had over 20 tackles and played amazing — the toughest, grittiest linebacker play in a long time. He has really become our leader and quarterback of our defense. He always knows what's going on and gels with what Jerry (coach Shaw, defensive coordinator) wants from the defense." "Kody is moving kids around and knows what the other team's offense is doing," he said. "He has really become an extension of the coaching staff and what better kid to do it than your middle linebacker." Madras has a home game Friday, Oct. 26, against Salem Academy (3-5 overall, 2-2 in league). "We are really taking the mindset of 1-0 every week and the kids are buying into it," Taylor said. "We focus on each opponent each week and it really works for us. The team is focused on these guys this week. Finish hard and do what we do. Take care of ourselves and see what happens. This game could be really special."